She’s also very proficient on the grill and with her marinades. Her BBQ chicken and short beef ribs makes me shiver with lip-smacking delight. When I asked her how she learned to cook, she told me she learned by watching, as if this was the most obvious answer in the world. For her farang (white) boyfriend and us Americanized kids, she’d make blueberry pancakes and bacon for special breakfasts. Steak, spaghetti and fast foods were also part of our diets. I remember the first time we tried Taco Bell. I might have been in the 3rd or 5th grade, but since Mexican food was as unfamiliar to my mom as was the country Mexico, I did the ordering. Looking up at the menu, I didn’t know what all the foods were, but quesadilla looked like an intriguing word, so I ordered that. When we got our tray back to our table with its mysterious wrapping, I eagerly opened it. The cheese filled tortilla looked pitiful and plain. We laughed though. My mom said she was ashamed because people might think we were too poor to order more. As an expat in her native land, I maneuver my nose around familiar dishes with the calmness that everyday outsiders would find bold or bland. And this is not because I’m an adventurous eater or a seasoned traveler, it’s just because I recognize the food, the smells and sights of Northern Thai dishes. 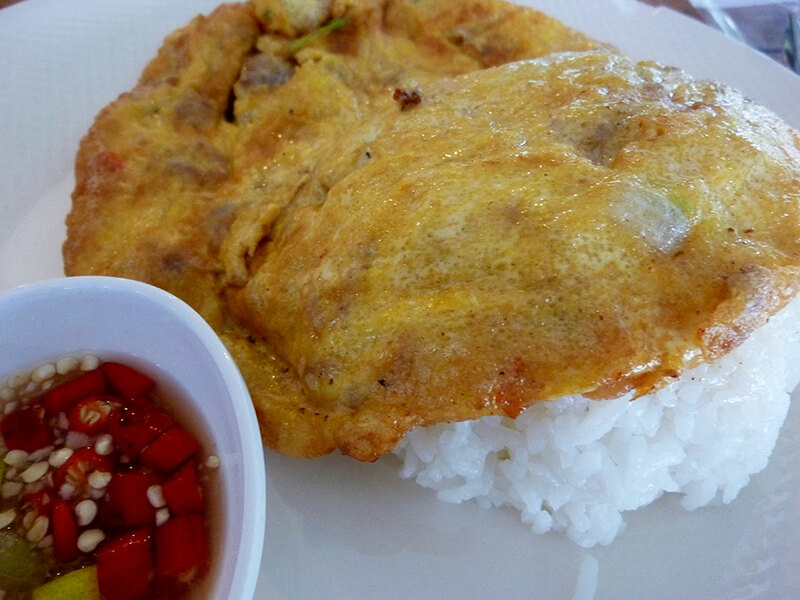 But my comfort food, my go-to dish, when I miss my mom or home is a very simple dish – a Thai-style omelet with rice. For a hungry hippo like me, it’s fast to whip up, tasty and filling. For many foreigners/Westerns, the idea of eating an omelet deep fried in oil with rice for breakfast, lunch or dinner fills them with distrust, if not disgust. A beautiful kai jeow (omelet) with nam prik (chili peppers in fish sauce) and steaming white rice. The ease in which kai jeow can be made is something that greatly appeals to me. It’s Thai street food, student food, easy-to-take-away food. When my mom was tired or didn’t feel like cooking, she’d ask if I wanted it and I’d say, sure. Then she’d end up taking longer making it because she would mince the pork with her cleaver. But normally, it’s a fast food. And I find comfort in that. My daughters favorite dish is Kai kow dao (not sure if I’m spelling that correctly), or steamed rice with a fried egg. She likes me to put some ketchup on it and she will want it for every meal. 🙂 My comfort food is gyoza with sriracha sauce. 🙂 Luckily I can find both of those here in Phuket. Your daughter is so Thai! 😀 and I love gyoza. I’m always pleased to see it (555) and have even cooked it at home. But I think I like most dumplings in general. I’m rather boringly mid way through P90X (or “Tony Horton’s Hour of Hell” as I like to call it) which means delicious things like this are off limits. However, if I was to choose my comfort food from the past it would have to be a roast dinner made by my mum. In Thailand though, this gets a little heavy – so I’d go moo larb. Can’t help but put me in a good frame of mind. Alas, the amount of Palm sugar in Thai salads makes it a no go. We try to make thai style food without it but…it’s never as good as the som tam from out local thai shack. I recently had your favorite dish and agree it was a comfort.. Since our first visit to Chiang Mai my Thai comfort food is Khao Soi. I sometimes make it at home and also go to a favorite place in town. Thinking back to my childhood comfort food was difficult and took me awhile to narrow it down. I finally had to ask myself, “If I could have any dish when I was feeling low, what would it be?” SOUP! Chicken Noodle, or Chicken and Dumplings, or Chicken and Rice. All with loads of onions, celery, carrots and ginger. Now look what you have done! I will be making one of these in my new slow cooker tomorrow! Thanks for the memory! You always inspire me in one way or another. Now, I’m going to make it!!! I’m off to the market to get the ingredients to a nice chicken soup 😀 But I can’t do dumplings. I have too much of a heavy hand. Yeah, khao soy is so wonderful, but since my mom doesn’t like it, I didn’t learn about it until I came to live here. Interesting, eh? I need to try that omelette with rice ! I don’t know what my comfort food is as I have the feeling that it is always changing. My comfort food is probably Thanksgiving dinner. Whenever I came home to visit after being abroad, we had turkey and stuffing. It’s just comforting due to the homecooked goodness and family-ness of it all. Plus, delicious. So I must weigh in here. Back when we lived in the US my favorite comfort food was Lasagna. Yep, me and Garfield although I don’t know who would have eaten more at one sitting but I’m sure there would be none left. Since we moved to Thailand I would agree with Lin that one of my favorites would be Khao Soi. Eating it at our favorite place, Khao Soi Khun Yai with the Winnie the Pooh tablecloths always puts a smile on my face and in my tummy. But my “mostest favoritest” comfort food now is Gaeng Hung Lay Moo over rice. Ohhhh, the porky goodness. Gaeng Hung Lay Moo is so fattening! 555 Not that you have to worry about that. Porky goodness…have to use that one, Vince! Cheers. what else do you put in your omelette? it looks so good! i like my eggs with a sweet fish sauce (nuoc mam, in vietnamese) or with maggi sauce. I love how I know exactly what you are talking about. When I don’t have fish sauce with chili peppers available, I like to use soy sauce (or maggi). I’ve been known to put in cheese, too. The perfect omelet though has minced pork and cilantro, maybe a little bell peppers. Lots of garlic and onions. Hi Lani, thanks for leading me here, or else I would have missed your interesting and tasteful story! Your mom must have been a very good cook. And then you even said the magic word cilantro oooh. Since I often cook Indonesian, onions, garlic and peppers are almost the basic ingredients. The soy sauce is ‘ketjap’, but it’s sweeter and thicker. Rice with omelet and sauce, that is a lovely combination. I could eat it for breakfast any time. Yum! Now I’m hungry. How interesting. Indonesian. I don’t think I’ve ever had Indonesian food before. And thanks for teaching me a new word 🙂 Happy eating. And having lived in Durango Colorado for 6 years (hail the American SW!!! ), I know exactly what you are talking about. It’s one of the things that I miss about the States. If I ever went back and could live anywhere I think this is where I would return. The SW is incredibly special. I love Colorado especially. I spent most of August house/dog sitting for a friend who lives there and enjoyed every single day of it. They really have no idea how incredibly fortunate they are to live there. Everyday was almost perfect weather, friendly people, deep blue sky with fluffy floating white clouds, great food, always felt safe, Rocky Mountains looming, etc. However, it is getting to be very expensive. The last couple of days I have been exchanging emails with my best friend in CM. He is thinking of travelling a similar route to what I am thinking to see much of SE Asia i.e. the Philippines, Bali, Indonesia, Malaysia, Vietnam, Cambodia, and several different areas in Thailand. I can always dream right, but must be careful what I wish for, LOL. Lucky you. That sounds perfect. A taste of Colorado without the commitment. And of course, if I really liked it, I could stay. But it is as you say, expensive. Ramen noodles (the good kind, not instant) and pot stickers. Childhood classics. At least in Hawaii. A nice steaming bowl of ramen, light broth and yes, I love me some pot stickers! Grilled cheese sandwiches. When I was a kid, my buddy’s mother made the best. My wife’s comfort food is steamed rice with shaved fish and soy sauce (her Mom is from Japan). This summer I’ve been taking Thai language lessons and as a result we have gotten to know a Thai woman here in our Idaho town that has a food wagon. At least once every week I had her Panang Gai over the summer. It’s my new comfort food. Kuhn Ohn has closed her business for the winter and I’m suffering from withdrawal. Glad to hear that you took Thai lessons and were able to make a new friend in food and in person. Thanks for sharing such a terrific story. Yes, but God help me, I’ve become an addict! I’m desperate, shaky and sick. I must have more of my comfort food! I need Ohn to prepare her Panang Gai in the form of a continuous IV drip. A southern “golden triangle” of Thai curries has me hooked! Pom chorp ah-haan Thai, pet maak, maak, maak …. Lani, As a kid in Hawaii did you eat Loco Mocos? That’s often touted as the number one Hawaiian comfort food. Savoury steamed egg custard with a bit of meat marinated in soy sauce, ginger root, etc. It’s a Chinese peasant dish. Not served in restaurants. The Japanese have an equivalent also. Love that 2007 photos –homey. Fast foods are always great comfort. This is definitely not the first dish that comes to mind when I think of Thai cooking, so I’m appreciating the new angle.